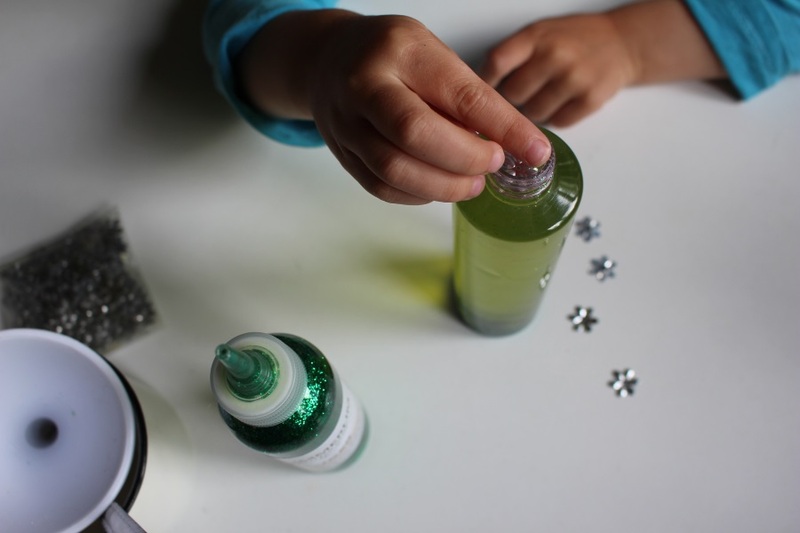 First time I saw posts about glitter jar (calm down bottle) was a really long time ago and already then I decided to make one when my kido will have a need to deal with his anger. Also I have seen a video, where six kids try to describe their feelings and their body reacton when they get angree. A girl told how anger is like glitters in a jar chaotically flying around and then slowly settling down, which I found as a really precise description, which is similar to my own feelings. Besides I have been reading this book for more than a year “The Wholebrain Child” (which is not because it wouldn’t be interesting, but because there are too little hours in my day, but thats another story) and what I have observed is that kids (and also grown-ups) have to understand their emotions to be able to deal with them. So it was the time. Two-and-half-year-old toddler anger issues, need for different sensory activities and my own interest in the result and therapeutic effect. Of course, it would have been easier to do this little experiment on my own, but I thought that Toms would like this new object (I won’t call it a toy) better if he had participated in a making and also on the days-without- a-nap we have to create some peaceful and patience training activity anywhay. 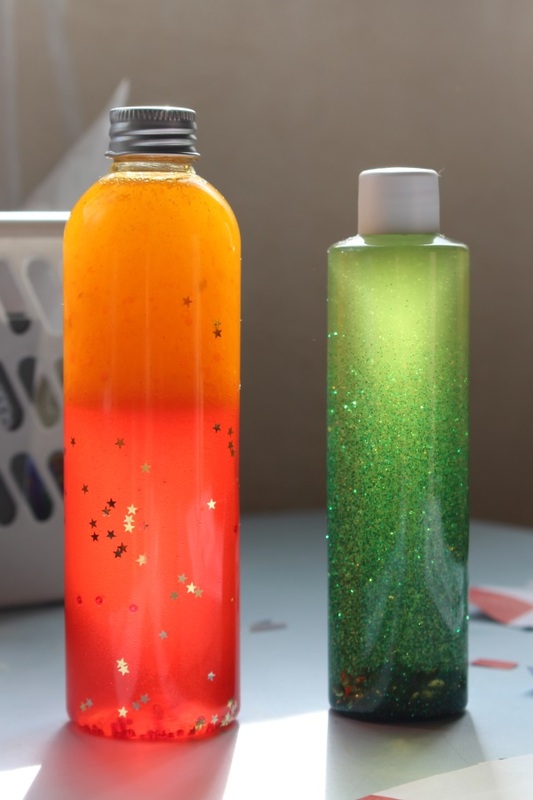 So me and my toddler together made two different types of sensory bottles. 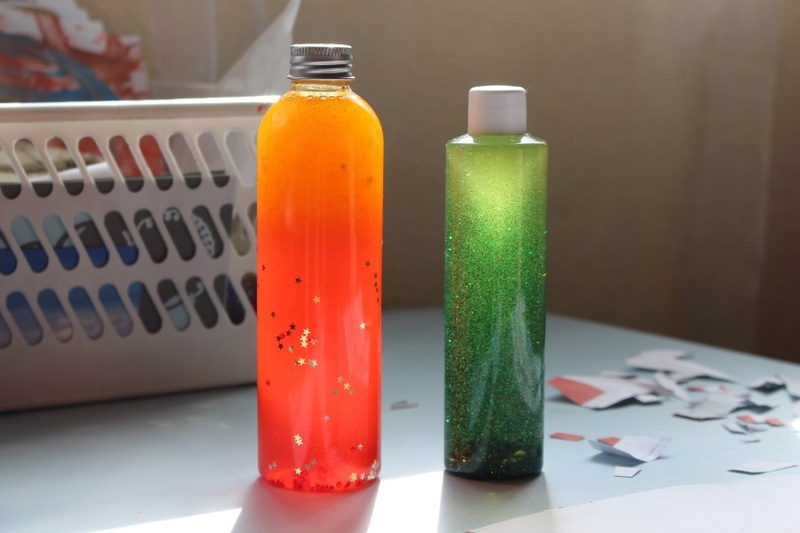 First – a “calm down” or glitter bottle and second – color mixing bottle. They are technically different, but I think that relaxing effect is similar. 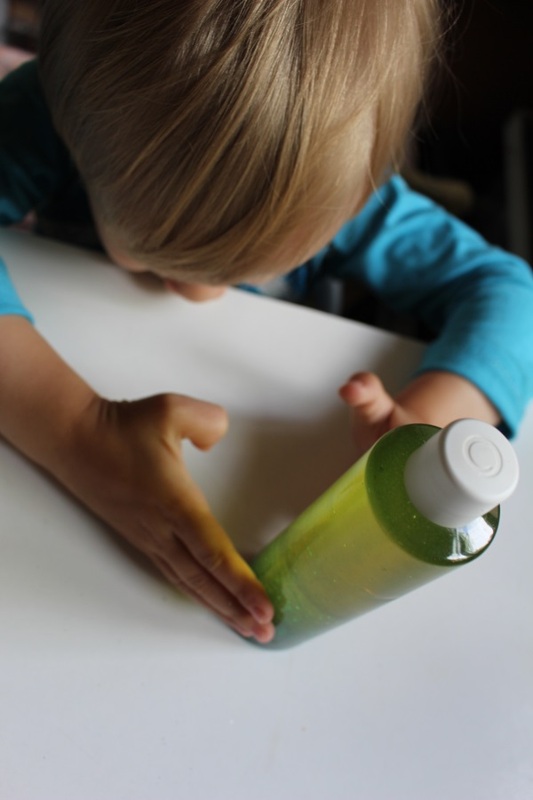 Sensory bottles have many types, but those particular can be used in two ways. First is to reduce the anger – every angry person, regardless of their age, can calm down easier when applying physical force, even if it is just shaking the bottle with all their heart. Then put it on a table and watch how glitters spin around and dance and settle slowly or how colors split up again. It takes about a minute depending on glitter and other ingredients amount. Second option is to understand the anger – when first fast anger has abated a little, you can tell your kids how their anger is just like the glitters spinning around and taking all the space of their head, but then the glitters and the anger start to settle piece by piece. You may have to shake the bottle two or three or more times till you manage to find some piece. Toms already tells me how the glitters are angers and then he shows how all the angers are gone! 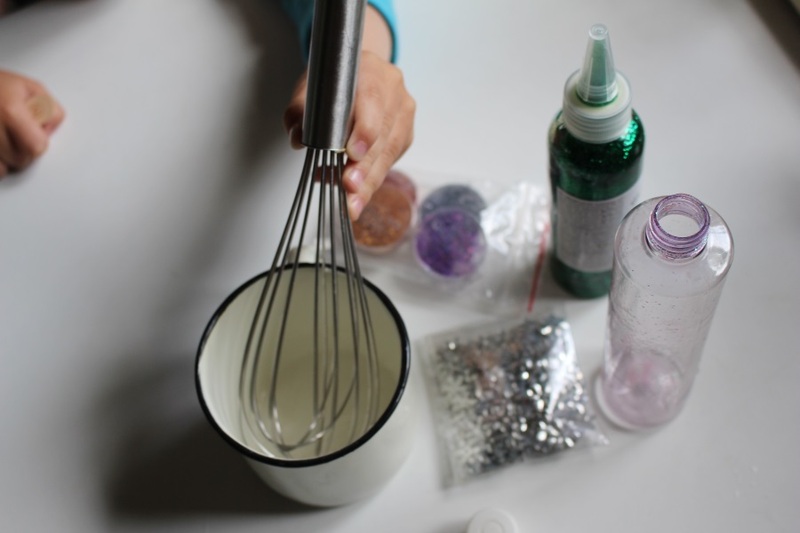 While water was boiling, we together squeezed out 1 or 2 tablespoons glitter glue in mixing cup (proportion should be 10-20% glue, but it depends on glitter glue). 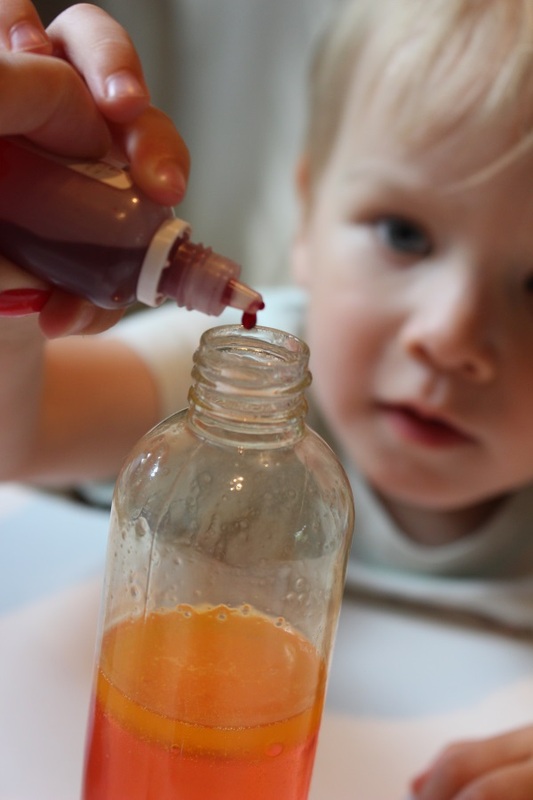 Then I gave him a bottle and flitters to put inside, while I added hot water to the glue and whisked together. Mixture should be less than will be in a bottle. When mixture is ready and cooled down a bit, Toms added fine glitter by his choice – violet and gold. We mixed again and poured in the bottle. 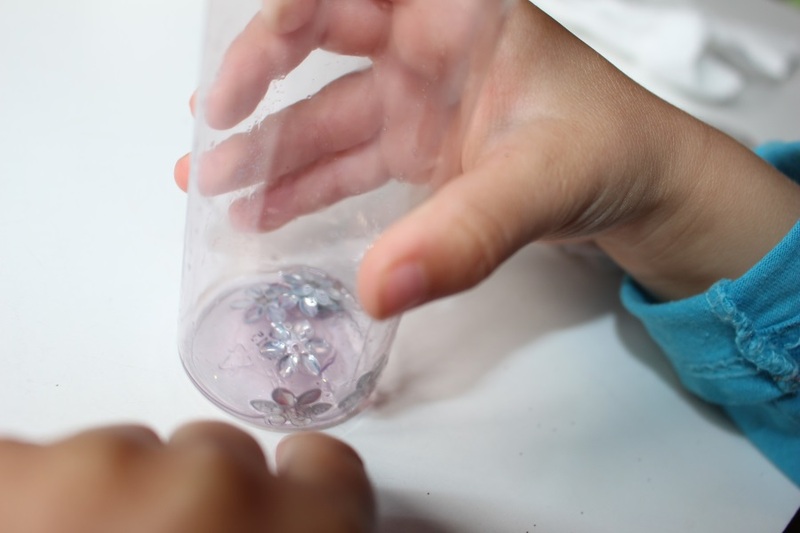 Some glitters remained on a cup and funnel, so we washed them down with more hot water and added in bottle. This is a moment to close the lid, shake and see if you need more glitter or something. We added more flitters and glitter glue. Again we closed a lid and shaked strongly. Then we added a little bit more water to the bottom of lid, so it would look full, but there would be space left for shaking. 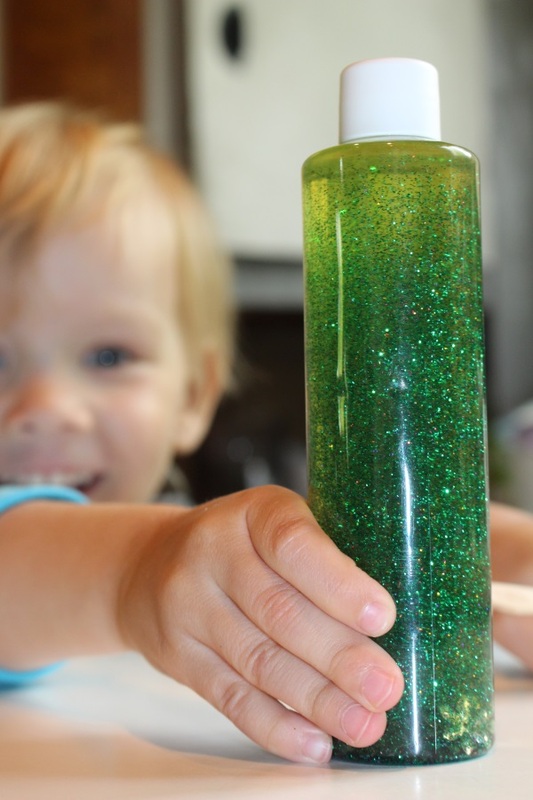 Our glitter glue colored the water green, but if yours doesn’t, then you could add a little bit food coloring. When we were satisfied with a result, I took off the lid and put the bottle in a safe place to cool down completely. I closed and shaked it every 30 minutes. 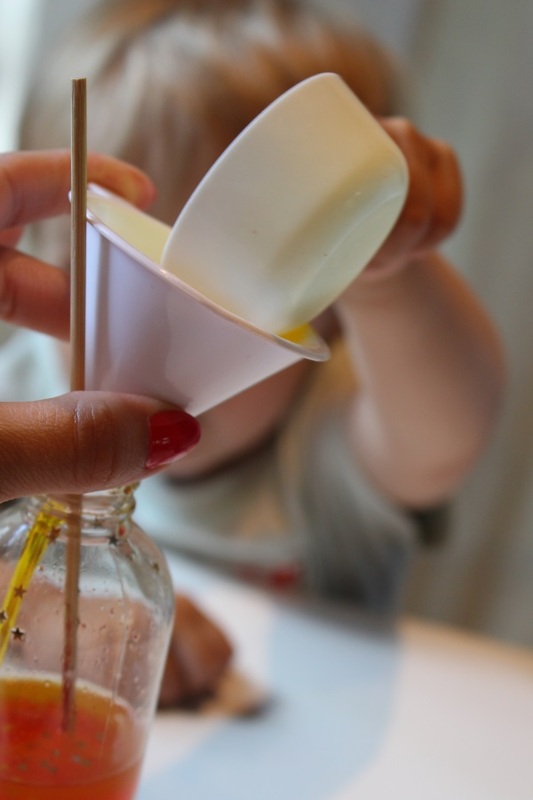 After few hours, when it is in room temperature, glue the lid with hot glue for safety. 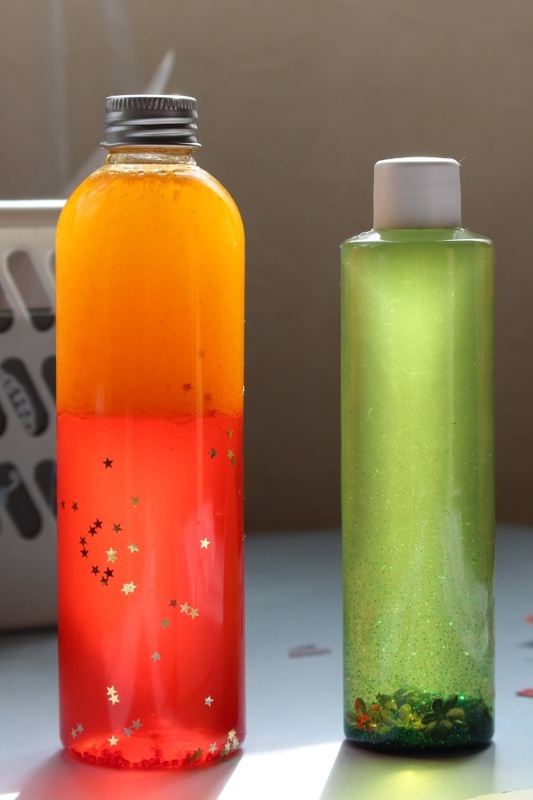 By the way there are many ways to make glitter bottles with different ingredients, so if you can’t find good glitter glue or wan’t to try some other recipe, then inspire from this blog! 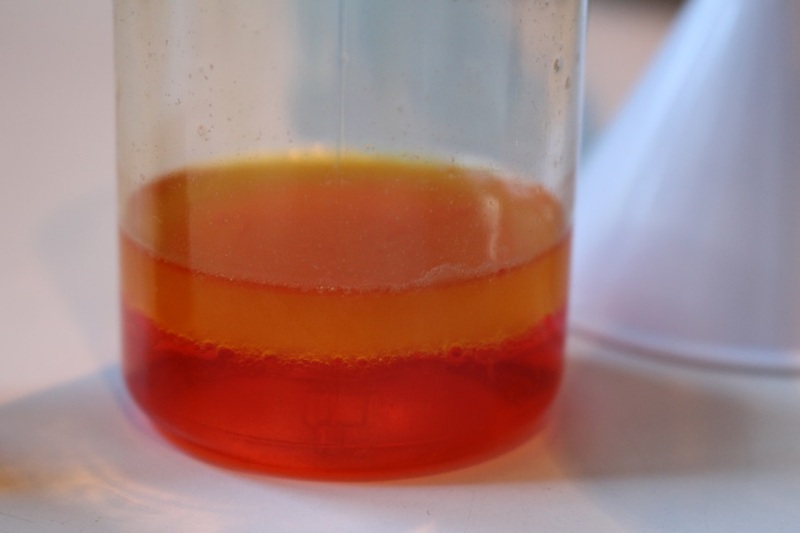 In all color mixing bottle recipes I have read there was a problem – how to color the oil. Food coloring is water based and colors only water. There are some special fat based conditory colorings, bet I have read thatthey also seperate from oil with time and mix in water. 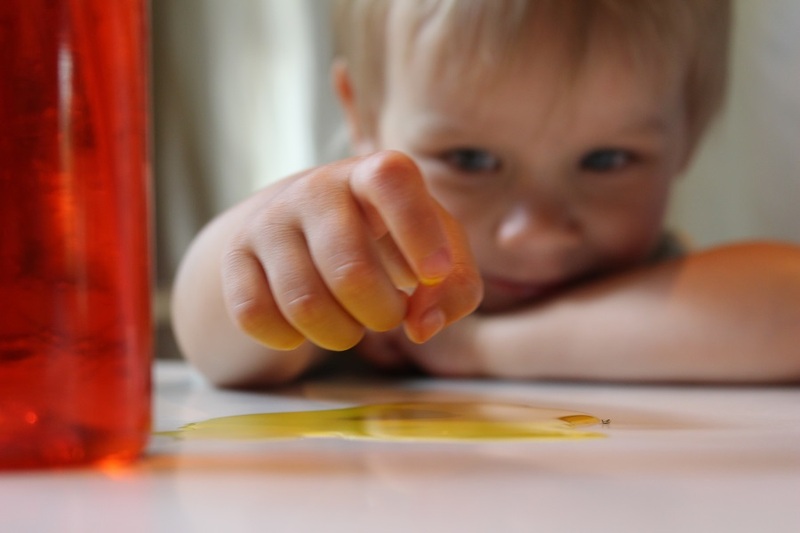 So I was thinking, why I should color the oil if I can use naturally yellow oil!? 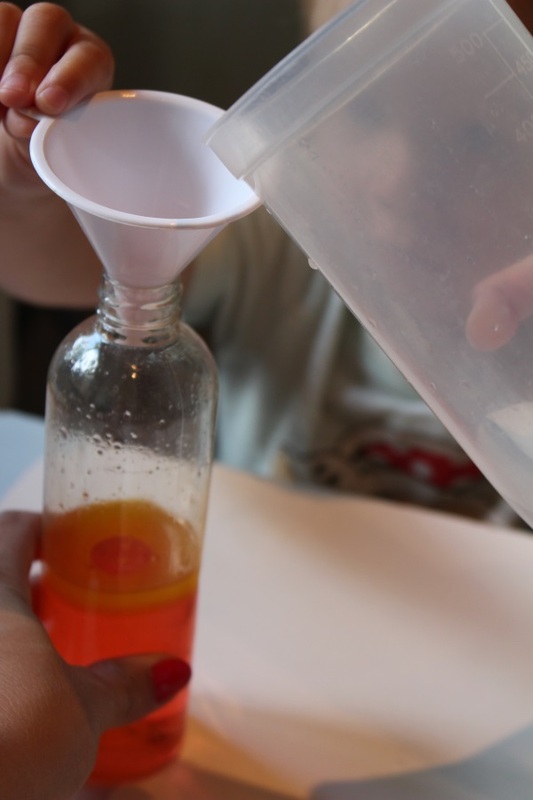 I am proud to name this the simplest color mixing bottle recipe! To be safe everything will work out as planned I tried with small amount in that same bottle, but next time I would try in another small bottle. 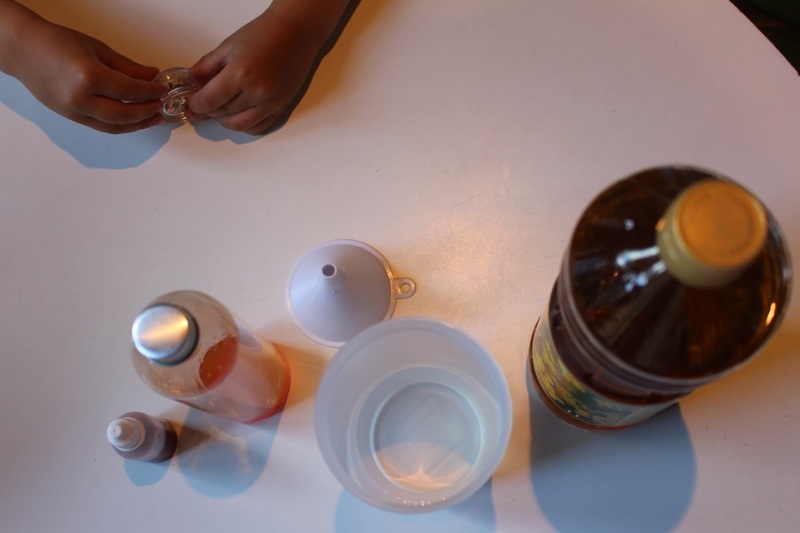 Preparation is very simple – place funnel in bottle, pour water in measuring cup (aproximately half of bottle volume) and Toms poured the water in the bottle. Then we together added like 5 drops of food coloring. Here is the reason why I told I would mix the test amount in another bottle – if there is only water in a bottle, then the food coloring makes beautiful drawing while diffuse in water. But when there is oil on top, food coloring stays on top of it till we mix it with a stick. After that we added oil to the bottom of lid and added beads and stars. But if you read this all and think that it all went smoothly and without some nerv tickling, then take a look on next picture for some reality check! Yes, oil somehow went outside of funnel and stars sticked more to little oily fingers than got inside of bottle. 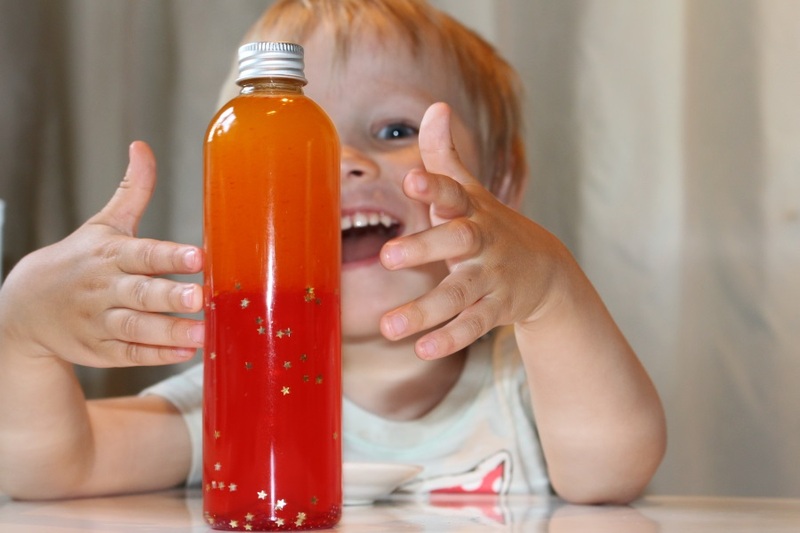 And be safe with food coloring – it may leave stains (woohoo, we managed to avoid that at least!). 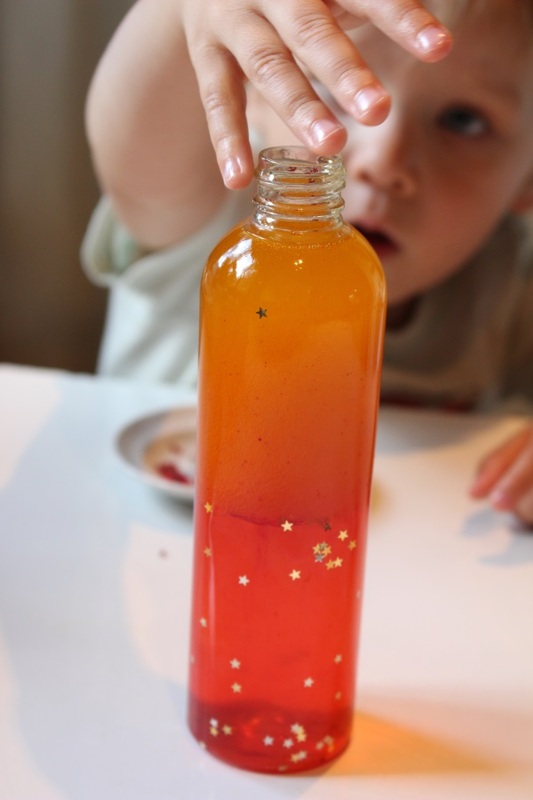 To check a result, we closed a lid and shaked the bottle, added some more red food coloring and beads and I closed the lid with hot glue (first clean off oil).